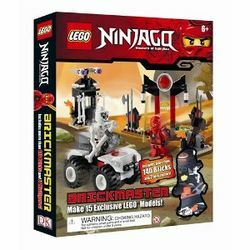 Ninjago Brickmaster is a Ninjago themed Brickmaster Book released on July 18, 2011. It has 48 pages, two minifigures, more than 140 pieces and a storybook. This is a description taken from DK. Do not modify it. (visit this item's product page) Includes more than 140 bricks, two minifigures, and a storybook! Make 8 Exclusive LEGO® Models! Build the coolest vehicles, buildings, and LEGO® Ninjago structures you can imagine! Enter the world of Ninjago, the LEGO Group's exciting new line of ninja-themed structures and minifigures, featuring an entire world of ninja heroes, villains and storylines. With more than 140 LEGO® bricks, two minifigures, and a book of instructions and stories, this Brickmaster kit lets young ninjas build and play to their heart's content. In the set, as well as in some other early Ninjago sets, the Sword of Fire is just a gold Katana instead of the new molded piece. The set was re-released in new packaging under the name "Build an Adventure". This time, the bricks were in a standard LEGO box instead of a hardcover book. The story and model instructions were attached as a smaller, paperback book. This page was last edited on 12 January 2016, at 23:32.